I love applesauce all year round... but especially in the fall. Fall is my favorite time of year. I love the colors, the smells, the crisp weather, & the warm, hearty food. 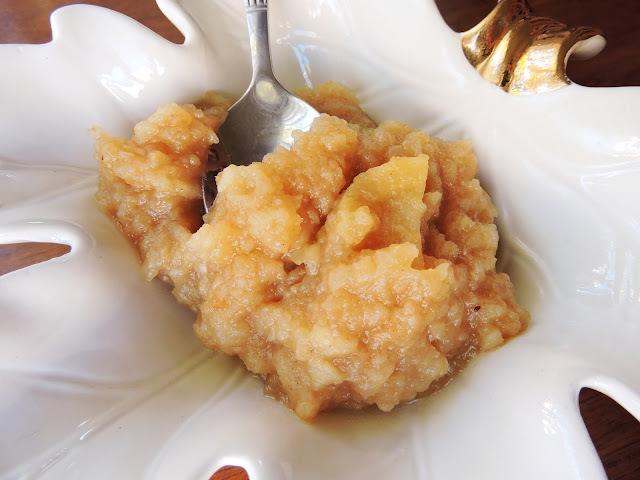 This is my recipe for super easy at-home applesauce. Perfect for using up some of your less pretty apples (bruises don't matter once they're baked). Great for entertaining, as your house will smell amazing & your guests will have a sweet, healthy dessert. I came up with this recipe after searching all around for a cinnamon apple side-dish to serve with the pork chops I was making for my boyfriend's "surprise dinner". Every site I found seemed to recommend canned pie filling & strange additives.... I decided to pass on that & make my own. 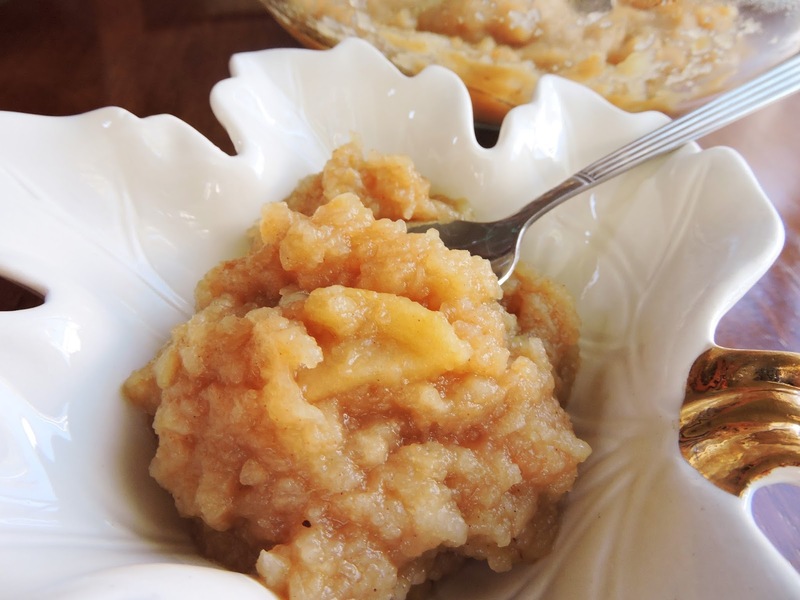 Apples are delicious on their own, so they don't need much help to create a great applesauce. Use whatever apples are your favorite, and feel free to mix & match to switch up the flavors. 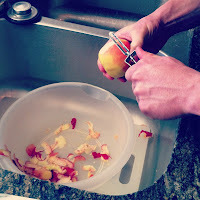 I go for Pink Lady apples, since they are a favorite of mine (& boyfriend's) for their sweet-yet-slightly-tart taste. This is amazing served warm for dessert (would be perfect with vanilla ice cream!) & just as good as a cold snack. Mix in some almond butter for some healthy fats & a little crunch! I hope you enjoy one of my most favorite recipes, & happy Fall! Coat a large baking dish with coconut oil spray & fill with sliced apples. Sprinkle with cinnamon & nutmeg & mix around to combine. Cover with foil & bake for 1 hour*. Remove from the oven & let sit for about 10 minutes. Use a fork to smash the apples for a chunky sauce like mine. 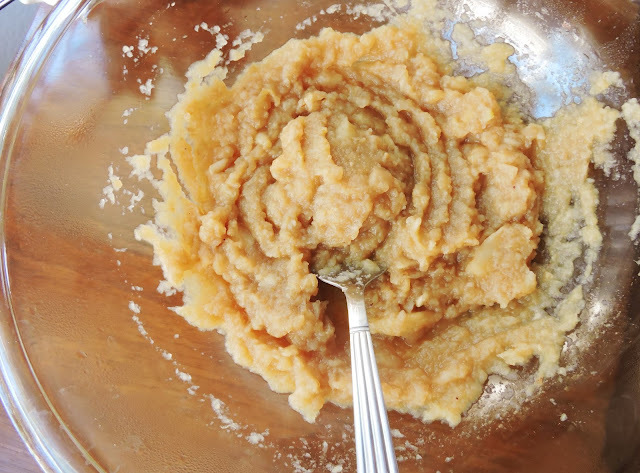 You can also use a blender if you like a smoother sauce. *I leave mine uncovered for the first half, then place foil on top for the remaining time. This makes a chunkier, drier sauce. If you like a wetter applesauce, cover for the entire hour. You can also make this in the crock pot! Just throw in all of the ingredients & cook on low for about 6 hours. Enjoy! P.S.~ this is recipe is from two years ago! I updated the pictures & felt the need to share it again, because I absolutely love it. Perfect for a Whole30-- serve over pork chops, then snack on it throughout the week. Delicious!